Los Angeles Summer Camp | Aloha Beach Camp Blog: Why Do We Operate Our Keiki Camp Program at Paradise Cove? Why Do We Operate Our Keiki Camp Program at Paradise Cove? All three programs take place at L.A.'s best beaches, lakes and water parks. In general, though, that's where the similarity ends - at least with respect to the specific beaches where the programs take place. The main difference is, while Kahuna and High Action campers travel to numerous aquatic sites on a rotating basis all summer, Keiki Camp generally takes place at a single beach, Paradise Cove, instead. For Aloha's older campers, namely our High Action and Kahuna groups, experiencing a wide variety of activity sites is a regular and important part of their camp program. For example, on Monday we might go to Zuma Beach, Tuesday Hurricane Harbor, Wednesday Castaic Lake, Thursday Oxnard, and Friday we might be back at Zuma. We intentionally designed the Kahuna and High Action programs this way so older campers could enjoy a wide variety of the best aqautic venues L.A. has to offer. Traveling from program location to program location, activity site to activity site, is fun way to go to camp. The older kids enjoy Aloha's itinerant program format because every day is a new adventure. In fact, depending on a given camper's registration schedule (you can choose your own days at Aloha Beach Camp), he or she could potentially visit a different beach, lake or aquatic site every day they come to camp. Now you might be asking yourself, why don't Keiki campers have a mobile program format like Kahuna and High Action kids? The short answer is, given their younger age, it's important for Keiki kids to experience camp in a more permanent setting, and Paradise Cove is the ideal place. For the most part, Keiki campers are extremely young. They're at a completely different developmental stage than the older kids. Most have not been away from home for extended periods of time or even to preschool yet. Many are experiencing the beach and ocean -- if not camp itself -- for the first time with us. 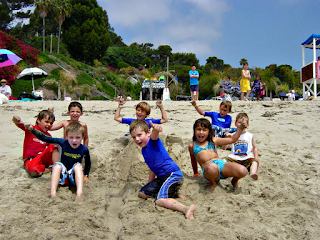 Accordingly, while most Kahuna and High Action kids view the opportunity to visit different beaches an exciting part of their daily camp routine, traveling to new places for camp each day could actually have a negative effect on the younger Keiki kids, who are generally more prone to homesickness, fear of the unknown, and may not adjust to change as well. As Dr. Laura Markham points out on Pregnancy.com, children (especially younger ones) tend to do better within the context of predictable routines and familiar environments. Knowing they will return to Paradise Cove's small, contained beach environment on a consistent basis provides the continuity and familiarity young children need to feel safe and secure. Equally important, it helps ensure their camp experience (especially those attending camp for the first-time) gets off to a great start so they will want to return to summer camp (even if it's not with us) for years to come.